Are you one of the thousands of fans going to attend Coldplay's Manila concert at the SM Mall of Asia Concert Grounds? You may want to check out this list of items prohibited. When going to large music events, one of the things to consider are what items are prohibited in the venue. To save you time fixing yourself on the long queue, know what items are prohibited. Strictly no medication / prescription drug of any packaging / bottles/ aerosols/ branded or unbranded medicines, or any kind will not be allowed inside the premises. No glass / pet bottles / aluminum bottles / cans / tin cans / hard plastic containers / no hard cardboard beer carriers / no cups. 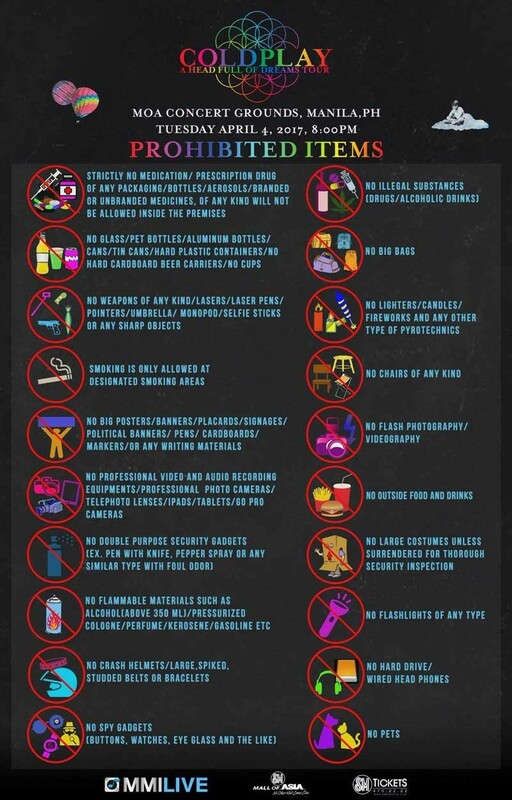 No weapons of any kind / lasers / laser pens/ pointers/ umbrella / monopod / selfie sticks / or sharp objects. No big posters / banners / placards / signages / political banners / pens / cardboards / markers / or any writing materials. No professional video and audio recording equipment / professional photo cameras / telephoto lenses / ipads / tables / go pro cameras. No double purpose security gadgets (ex: pen with knife, pepper spray or any similar type with foul odor). No flammable materials such as alcohol (above 350ml) / pressurized cologne / perfume / kerosene / gasoline. No crash helmets / large, spiked, studded belts or bracelets. No spy gadgets (buttons, watches, eye glasses and the like). No illegal substances (drugs / alcoholic drinks). No lighters / candles / fireworks and any other type of pyrotechnics. No chairs of any kind. No flash photography / videography. No outside food and drinks. No large costumes unless surrendered for thorough security inspection. No flashlights of any type. No hard drive / wired head phones.